Remember how concerned the media was over China's treatment of protesters during the Olympics. What if it was happening closer to home? It could never happen here, right? I guess there has been a change. You now have the right to free speech as long as you say the right thing. I suppose one excuse we can permit is that the media rarely corrects this kind of crap. I've been keeping tabs on the latest use of American air power in the rarely mentioned Global War on Terrorism where we bombed an Afghan village that allegedly held many militants. Allegedly we killed as many as 90 innocent civilians as well. What strikes me is our administration's position, consistently held in other incidents, where at first we claim no civilians were killed and then we claim there were far fewer than everybody else says. Granted we sent troops to check the strike zone the next day so the conflicting reports will have to be investigated. Still, in this case we claim only five innocents. (I'm absolutely positive the Christians of our nation who work diligently for the Right to Life are up in arms about the innocents we kill in other countries. Okay, maybe not.) Our reliance on precision guided munitions does nothing to further our administration's cause. Sure we can pinpoint exactly where the bomb is going to hit but we can specify who it's going to kill. And we're talking about bombs large enough to destroy the place it hits as well as neighboring houses because you can't specify how large the explosion will be. This has happened many times in Afghanistan and Iraq and it's a huge sore point for everyone except our administration. Claiming there were fewer innocents killed is hardly a great selling point for us. Can we justify the death of five innocents? If so, why not 20? Twenty thousand? Can we draw the line anywhere except zero? Hence the folly of using military force to win the hearts and minds of people. When we hear about these incidents how many of us do no more than our best Seinfeld, "Yeah, that's a shame"? No, I'm not revisiting John Denver's triple platinum album from the year I graduated high school. Remember when radio stations would play an entire album after its release? Heck, remember when radio stations didn't play the same songs over and over? I'm having a serious digression problem here, eh? It's good to be home after backpacking and then going to Washington, D.C. I want to share one observation about flying. When they call for people to board rows 17 and higher, some people in rows 16 and under get in line. I think they want to make sure they get the overhead space. The attendant scanning the boarding passes notices that some of the passengers are jumping ahead but doesn't call them on it. Instead they announce a "reminder" over the PA that they're boarding rows 17 and higher as if the people jumping ahead didn't understand what they were doing. It is just as effective as speaking loudly to someone who doesn't understand English. It doesn't change anything but it makes at least one person feel better. Every Olympics I remember we measured our success by the number of gold medals. And we were always first. 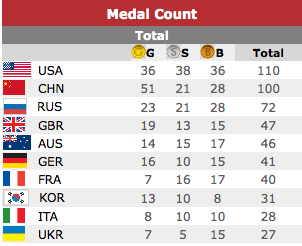 This time we measured it by the total number of medals and it's easy to see why. I remember an old joke concerning the United States-Soviet Union rivalry of years gone by. A Soviet and an American had a race and the American won. In the Soviet Union it would have been reported that the Soviet racer came in second and the American came in second to last. What does it say about a country that cannot tolerate anything less than being first? Update: I've since learned we haven't always led in gold medals. I stand by my point, however. John and I had an amazing and arduous backpacking adventure around Mt Rainier. We experienced beautiful scenery, mosquitoes, gale force winds, hot days, freezing nights, rain, sleet, steep ascents/descents, fording a freezing white water river, and ninety-three miles of walking with 40+ pounds on our backs. We had originally planned to finish in eleven days but bad weather forced us to speed up and cut it to nine. Tomorrow I drive to Tacoma and meet up with my brother John. Thursday morning we begin our eleven-day trek of the Wonderland Trail. Later. I was watching Stephanie's Taekwondo class last night and one young man was having difficulty. They were practicing a series of strikes, part of which they swung their fist backwards and away in a low arc. The boy was not doing that part correctly so one of the black belts tried to talk him through it. He still wasn't getting it so the black belt guided the boy's arm through the entire series ending with the boy's fist going into the black belt's groin. While the boy was embarrassed he also had this look of comprehension and total understanding. After that, he not only did the strikes correctly, but with a look in his eye that in no uncertain terms told me he was taking out the 'nads. We do so much better when we understand the purpose of our actions, eh? Distraction added a few miles to my commute this morning. I've been obsessing over preparations for my backpacking trip. I'm going to be in the wilderness for 11 days and I want to make sure I have everything accounted for. This morning I headed off to work and after 2-1/2 miles I suddenly realized I didn't bring my clothes. (Well, that explains the nagging feeling I had when my panniers seemed emptier than normal.) I treat my commute as a workout so I must clean up. Nobody wants a computer guy in bib shorts and racing jersey funking up their cubicle space. And I wouldn't care for the notoriety of being an employee in the Thomas S. Foley United States Court House building observing No Pants Day on the wrong day. Heck, we don't even celebrate it on the right day. And I would've been shirtless, too, so it would've been more like Jockey Shorts, Belt, Shoes and Socks Day. (Yes, I only forgot the shirt and pants.) Not liking the picture that formed in my mind I returned home and retrieved my clothing for the day. Josh and Steph acquiesced to riding to the Bowl and Pitcher and camping overnight. I attached the Bob trailer to the tandem and loaded the panniers on my bike for Josh. It was an easy 10-mile ride but it was still hot. The visitor office was closed when we arrived at the campground so we cruised around looking for the overflow area. The camp host was kind enough to direct us and we had to share this huge area with only one other camper. After setting up camp and eating dinner (freezer bag cooking is so nice) we hiked around and played by the river. A bizarre trial was recently held on our military base at Guantanamo, Cuba. Salim Hamdan, an admitted driver for Osama bin Laden, who fully cooperated and told everything he knew of his minor role, was found guilty of supporting terrorism and sentenced to 66 months imprisonment. After reading the narrative of how his trial went, I began wondering. Here is a man who has been imprisoned for seven years already who played such a minor role that he was considered a simple hired hand and he is our showcase for our first military commission? The charge of supporting terrorism is so vague, he could have be found guilty of it had he only provided directions to bin Laden's driver. The 9/11 Commission Report, a copy of which I bought at an airport book store, was considered classified at the proceedings. Why? The court was closed for much of the defense's case, where most of the prosecution's case was held in open court. How credible are the proceedings if they are held in secret? Whether or not Hamdan was found guilty, he would still be held indefinitely at Guantanamo. So the big question is, what's the point? In today's Spokesman-Review there's an article about woman running for the Idaho legislature. What is so remarkable about her? She's openly gay. What is the point of saying "openly"? Why the distinction? After all we never hear about closet gays running for office. Do we look at two people and say we think he is a Christian but she is openly Christian? Do we remark that someone is openly criminal? Openly polite? The article has one paragraph describing in general what the candidate wants to work for if elected. But the vast majority of the article is about her being gay and her opponent who thinks her sexual preference will help him get reelected. But it does say she is open but not effusive about being gay. What a relief. She won't be coming to my door like those openly Jehovah's Witnesses. Thank God that blasphemy is protected by the First Amendment. Looking over my primary election ballot, I can't help but notice the Republican Party candidates who list "G.O.P. Party" instead of "Republican Party". 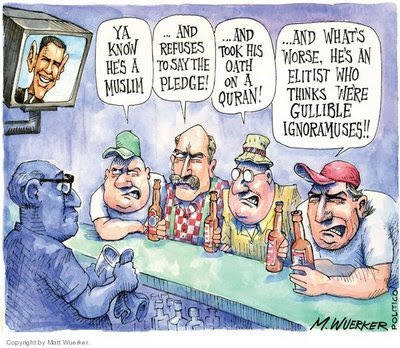 It's as if the Republican Party has a bad name or something. I mean, how did that happen? G.O.P. stands for Grand Old Party. So apparently these former Republican Party candidates would rather be associated with the Grand Old Party Party. They might be on to something there. Grand Old Party Party fundraiser events would probably be more fun. And with their versatile party stance I bet you could hook up with them just about anywhere. I bet they even party when most people are asleep. And with a name like Grand Old Party Party, it sounds like they could make a tidy profit. I suppose I can't blame the Grand Old Party Party members for differentiating themselves. After all, being associated with the Republican Party can be a real killer. Get up, you're going to sleep your life away! This morning I woke up early--three-frickin-thirty in the morning--and couldn't get back to sleep. Danged aging process! I thought I'd make the most of it and try out Sun's Virtual Box. Just for grins I wanted to get a virtual copy of Win XP running on the iMac. The Virtual Box installation went well. The Windows installation kept failing. Bummer. Rather than mope around until it was time to go to work, I decided to leave early and take the scenic route. I followed Hastings to Mill to Waikiki to Rutter Parkway to Nine Mile and rode the Centennial Trail to the West Central neighborhood. I would generously allow that 20 of the 27 miles were near nature. 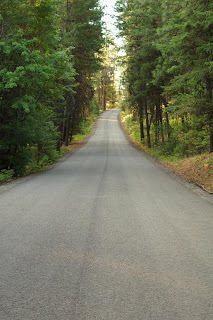 I brought the camera along because my experience has shown that opportunities abound on that route. 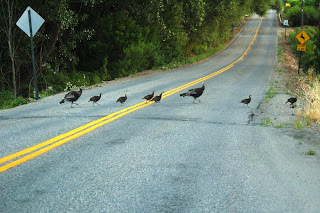 I stopped for a group of turkey hens shepherding their young charges across the road. 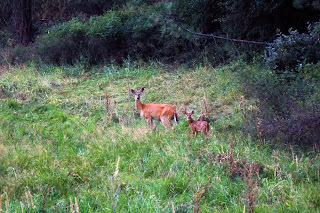 A doe and her fawn caught my attention. And I theirs. I couldn't believe I had the trail to myself for miles until I saw a jogger by SFCC.